I was a bit skeptical about this next choice for the Baton Rouge Hidden Gems series, Delpit’s Chicken Shackon North Acadian Thruway in Mid-City. 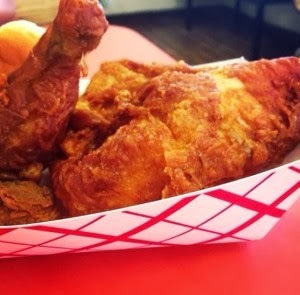 Fried Chicken is a pretty common find in the south and with Popeye’s and Church’s on nearly every street, is it really worth it to drive over to the Chicken Shack? After last week’s lunch, I’m a believer! Delpit’s Chicken Shack has been serving up unforgettable meals since 1935. It is a strong favorite among Baton Rouge locals for yummy tailgating cuisine for LSU and Southern University games, daily lunch specials, and dinners for the whole family. They have two locations open 6 days a week. Prior to going on this lunchtime adventure, I was told by Baton Rouge locals to order the Shack Balls (rice dressing battered and deep fried), homemade peach cobbler and of course their claim to fame, the fried chicken. I drove up and ironically, Church’s is right across the street, which doesn’t seem to faze the Chicken Shack. I had minimal wait-time but definitely noticed a steady flow of hungry patrons the entire time I was there. They also had plenty of regulars which is always a sign of delicious, consistent food! When I opened my order, I immediately noticed the screaming hot, crispy chicken. The side items were tasty, uniquely southern choices, but honestly, the chicken was outstanding! This may be the best fried chicken I have ever had. If you’re in the Baton Rouge area, try Delpit’s for a local favorite that gets it right! 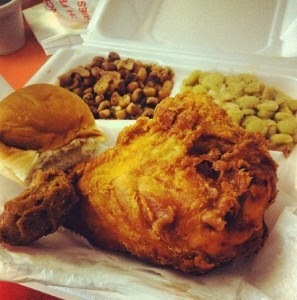 Delpit’s Box Lunch: Fried Chicken, Black Eyed Peas, Lima Beans and a fresh roll. They also have a mobile food truck – CHICKEN SHACK EXPRESS – coming to an area near you! Follow their Twitter to see where they’re fryin’ up chicken everyday and like them on Facebook! For more information, check out our website at www.visitbatonrouge.com or www.chickenshack.org! Go BR and Get Fed!